It’s Jana again. I hope you all had brilliant summer with lots and lots of nice pictures to scrap. I have TONS. Now comes the time to relive the moments and put it all in the albums and minialbums. This time I worked with the beautiful summery collection Let’s go. It has the vacation feel, doesn’t it? The first layout I am going to show you is a Project Life spread. Well, it has a pocket look but it is actually cards of papers and photos glued on big 12x12 white cardstock. In my PL album I love to break up the pocket structure a bit and from time to time I challenge myself to do a big layout. 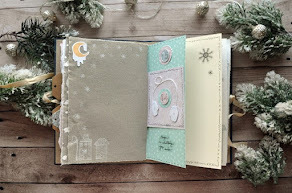 And on the other side of the layout I do a classical PL spread with the difference that there are no pockets and everything is just glued directly on the card stock and placed in a 12x12 page protectore. I love doing these spreads. You can create any composition you wish, the embellishments and cards can be overlapping and it all comes together to make a nice change. As you can see, I used four different designs of paper – the watery blue ones and to break it up a bit, one with green leaves and one with pink stains. And the word stickers are just great. You just need to be quite gentle and patient when peeling it off but it is so worth it! The other project is a mini layout in my “Friends” Traveller's Notebook. This is my Design team colleague and friend. The layout itself is super simple. I chose this pattern paper only because these are the colours I associate my friend with. That’s it for today. Can’t wait to see all your lovely summer projects tagged #studioforty.